Meet Ben Palmer, owner of Expressive Structures and Featured Business Owner at SCORE Chicago this week. Learn how he started and what tips he has for your success. Expressive Structures transforms and brands corporate event space using modular scenic systems and seamless printing. Our clients are audio visual companies and marketing agencies large and small as well as independent producers who need a custom branded scenic solution for their event. 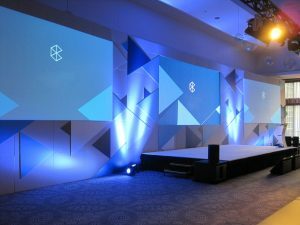 We recently provided a set design for a marketing agency that wanted to carry a triangle theme out of their media and onto the scenic. We achieved this thru integrating custom printed elements with our rental scenic to supply a wow factor for a reasonable cost. We added value by coordinating with the audio visual company directly to make sure our solution would conceal the support structure for the center LED screen giving the client a clean and professional finished look. We are able to provide unique and creative scenic solutions to convey our client’s brand and message in an impactful way for a reasonable cost. Being a friendly resource for my clients. Even when I get a call for equipment or services I do not provide I try to refer the client to the right person in my network. It establishes a dialog which leads to introductions or future calls when they do need what I provide. I also try to persistently reach out to our clients as it can lead to a show, an unexpected referral or give me insight on what I need to provide to stay relevant. Listen to your clients. When I was trying to sell our solutions I was struggling. Once I started listening I was able to spot opportunities for our company to become a better resource for our clients. Your clients will tell you what they need and reveal their pain points if your asking questions and listening. Many thanks to my SCORE counselor Jerry Folz. Jerry has been a great resource over the years. When I encounter a business need such as an accountant or email marketing company Jerry knows the landscape and can provide a few resources to explore. He also questions my logic on a regular basis which is great because I often fall into the trap of making unfounded assumptions and that can be bad for the health of the business.